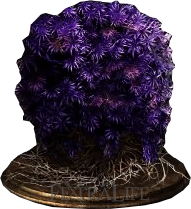 Purple Moss Clump is a Consumable in Dark Souls 3. Medicinal purple moss clump. Reduces poison build-up. Cures poison. Poison builds up in the body, and when it breaks out, it causes gradual damage over a period of time. Poison can be exasperating, so be sure to carry sufficient moss clumps when traveling to a blighted area. Reduces poison build-up and cures poison status. 6x Sold by Shrine Handmaid for 500 souls. Sells an unlimited supply after giving her Paladin's Ashes. Rare drop from small crabs in Road of Sacrifices. 3x Found along the wall in the swamp, to the right of the Farron Keep bonfire exit. 4x Found on top of a broken walkway path near the first extinguishable fire in Farron Keep. 2x Found right in front of the second extinguishable fire in farron Keep. This is innaccurate, or I&apos;ve done something wrong. I got the paladin&apos;s ashes and gave them to the shrine handmaiden. She still is "out of stock" for me. The Shrine Handmaid provides me with an unlimited supply of these, but I&apos;m not sure what cause the change from her normal stock of 6. After you give her the Paladin Ashes, which is located just to the left of spawning from Cathedral of the Deep&apos;s first bonfire, down a small pathway. I&apos;ve missed it several times on other characters I made.